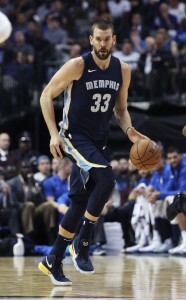 9:05pm: The Raptors have officially acquired Gasol from the Grizzlies, sending Valanciunas, Wright, Miles and a 2024 second-round pick to Memphis in return, the teams announced on Thursday. 12:55pm: The Raptors and Grizzlies are finalizing a trade agreement that would send Marc Gasol to Toronto, reports ESPN’s Adrian Wojnarowski (via Twitter). Memphis is expected to receive Jonas Valanciunas, Delon Wright, C.J. Miles, and a 2024 second-round pick in exchange for Gasol, according to Wojnarowski (via Twitter). It’s the latest major development in what has turned into an arms race among the Eastern Conference’s top contenders. The Sixers acquired Tobias Harris on Wednesday morning, and the Bucks reached a deal to acquire Nikola Mirotic earlier today. The Raptors will surrender some depth in the trade by giving up three rotation players, but none of Valanciunas, Wright, and Miles were starters. In acquiring Gasol, Toronto will add more firepower to its frontcourt, acquiring a veteran center who has been linked to the club for years. A former Defensive Player of the Year, Gasol has slowed down a step or two at age 34, but he’s still a productive scorer (15.7 PPG), rebounder (8.6 RPG), and rim protector (1.2 BPG). He has also added an outside shot to his game in recent years, making 35.7% of his attempts and 1.4 threes per game over the last three seasons. It will be interesting to see how the Raptors manage his minutes in a frontcourt that also features Serge Ibaka and Pascal Siakam, both of whom are having excellent seasons. The Grizzlies, meanwhile, will move on from a three-time All-Star who has been in Memphis since 2008. Despite Gasol’s long tenure with the franchise, it appeared this week as if he was ready to move on, having cleared out his locker when it looked as if a trade to the Hornets was a possibility. That deal with Charlotte never got too close to being finalized, notes Sean Deveney of Sporting News (Twitter link). In exchange for Gasol, Memphis gets a productive center in Valanciunas, who is set to return from a hand injury, a promising young point guard in Wright, who will be a restricted free agent season’s end, and Miles, a sharpshooter who has had a down year. The Grizzlies will also acquire a future second-round pick, though it’s hard to determine how much value that selection will have by 2024. Valanciunas has a $17.62MM player option for next season, while Miles has a $8.73MM player option. Both players look like solid bets to opt in. It’s not clear yet what Gasol will do with his own $25.6MM player option for 2019/20. The Raptors would have his Bird Rights if he opts out. Gasol also has a 15% trade kicker, which will be applied to his 2018/19 cap hit, tweets Bobby Marks of ESPN.com. That bonus would increase Gasol’s cap figure by close to $1.3MM if he doesn’t waive it. Marks also observes that this deal will leave the Raptors with just 11 players under contract after they also sent Malachi Richardson to Philadelphia. The club will have two weeks to get back to the league-mandated minimum of 14 players, so it could be an active month in Toronto. Draft picks as a whole have seen their value skyrocket in the past 5ish years. Especially second round picks for various reasons. Why does everyone want picks so bad. Even if u end up between 5-10 u get a lot of Julius randles or ntikilina or Luke kennards which aren’t worth anything 3-4 years in. I just don’t get why everyone treats em like gold all the time. It’s a roll of the dice. I’d rather know who I’m getting instead of hoping to get a top 5 pick. Wright has really never been given a chance to show what he can do. He’s got a nice all-around game and should prosper there. Wright has struggled as a primary ball handler. He’s better playing off the ball. It’ll be interesting to see how the Grizzlies deploy him. All these trades! This deadline has been fantastic in terms of entertainment! A bit surprised Gasol couldn’t fetch a first round pick. Of those players coming back, I like Wright finally showing what he can do. I don’t think many teams were willing to part with a first round pick for a 34 year old center. Gasol is decently solid all around player, but he doesn’t really fit in this fast paced, positionless league anymore. What happens in the postseason when most teams are playing wings? Seems like a trade that helps in the short term but kind of puzzles in there ability to win a title. It’s all about Embid – making him work on both ends. The article doesn’t mention it, but Gasol averages 5 assists a game on top of some blocks and steals, quite a few boards, and some points. Embid isn’t going to be able to rest whenever Gasol is on the floor. And, while Gasol isn’t what he used to be, he’s a crafty old guy with a big body. He will find ways to limit Embid’s inside game. Time for Powell step up earn his money. He will be needed off the bench more than ever now. He’s expensive rn. But don’t lose total faith yet. Good for Masai for pushing chips in. Think that Gasol fits in well with what they do. They may be the east favs right now? He’s sitting now so he doesn’t sit in the playoffs. Philly? Is that a joke? At least 2 of philly Toronto Milwaukee Boston will have to be gone after the second round …. Masai kills it again. Trades spare parts for a big addition. KL, Green, KL, Ibaka, Gasol, Siakim, FVV, OG, Powell + a potential buyout added guy and that rotation is looking GOOD. Best they’ve ever had maybe. Not the best rotation ever. Prior to the deadline their 1-12 was great and last year was awesome too. But this starting lineup and top 6-7 deep is the best they’ve ever had in my opinion. How deep is the rotation going to have to be past 8 guys in the playoffs? With these 8…not very much. Great acquisition for Raptors. Gasol is a true pro and will make major contributions to them in playoffs. He will help against the bigger centers they will see in the east playoffs. Gasol fits their style of play, this makes for some great basketball ahead for Toronto. I might be rooting for the Raps for the playoffs due to this trade. There has been the popular opinion for years that Memphis should trade Gasol. Now it seems a bit anticlimatic but at least it got done, and he’s not done. This year he has boosted his assists without boosting turnovers. In his alternating healthy-year/offyear history, this is a good year, but if he picks up his option, he will be well overpaid next year. Enjoy it now.